← When is a non-function not a non-function? Witton also has a great sense of humour, which is well exemplified in the illustration captions (“Tupandactylus imperator doing his best Clint Eastwood impression…”)with the humans included for scale 0n reconstructions tending to be himself, or his other half feeding the pterosaur a mouse. I highly recommend it, and for myself it is mainly a reminder that there really is no greater value in palaeobiology than celebrating the structure and lives of such magnificent citizens of a past world, with the additional thrill of having to do detective work and imaginative reconstruction that modern naturalists are spared. But I haven’t entirely been spared evolution controversy, because it raises its head as soon as the book addresses the issue in chapter three. This isn’t because of any authorial failure – Witton covers the ground well. It’s not that there’s anything the matter with controversy, either – half the fun in palaeontology is the development and revolution in ideas about fragmentary remains. Who would have thought a few years ago that we’d be talking about warmblooded creatures as tall as a giraffe covered in down and flying actively after launching themselves from the ground? And it’s not even that knowing the evolutionary history is irrelevant. Pterosaurs are completely extinct, and most soft tissue isn’t fossilized, and so good anatomy and physiology depends on comparing them with the right critters. It would be good to know who their ancestors were. No, the problem is that pterosaur evolution is as opaque as that of every other significant grouping in biology. 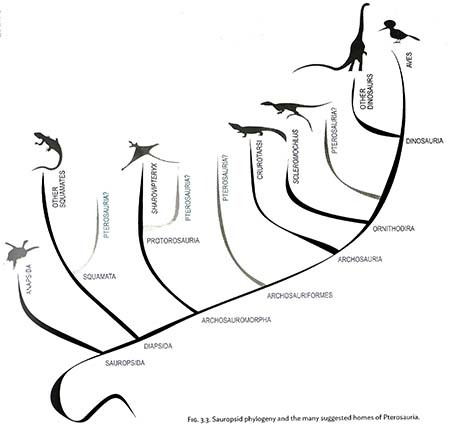 In groups with living relatives genetic trees are commonly significantly variant from morphological trees, but even looking purely at morphology (as one must with the flying reptiles) there is no such thing as even relative certainty. Evolution not only always seems to happen somewhere else, but covers its tracks well. 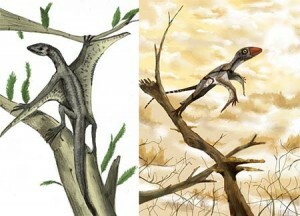 Even the classification within the 100+ species of pterosaur is hotly contested beyond the general division between long tailed and short tailed types. So in reading that chapter I was amused that, once again, the adage “Nothing makes sense in biology apart from evolution” in practice means little more than a mental framework of descent with modification according to lifestyle. The science in the rest of the book is “harder” – palaeontology and its technical support, anatomy, physiology, ecology, with only enough imagination to arrive at the best combination of those things and some lifelike pictures. We arrive at real, if fuzzy, knowledge (like Fig 21.1, in which the sun’s glare obscures some unknown details of Lonchodectes anatomy!). It’s a great book. Then today I chanced upon this piece by David Berlinski, critiquing Nick Matzke’s critique of Stephen Meyer’s new book on the Cambrian explosion. It’s about cladistics (a term introduced just one year before I started my A level zoology course). It bears, of course, Berlinski’s sardonic trademarks – but justificably so, in looking at clades from a mathematical perspective. 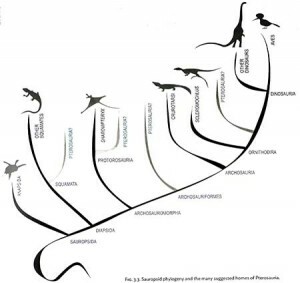 It may appear that the article denies common descent, but that is not Berlinski’s case. What he says is that cladistics is neither evidence for, nor reliable information about, common descent. Briefly, as you’ll see, clades are no more the precision tool they appear to be than imaginary reconstructions and namings of the first pterosaur are science rather than fable.